WASHINGTON (CNN) -- The servers hosting the Web sites of the House of Representatives and its members have been overwhelmed with millions of e-mails in the past few days, forcing administrators to implement the "digital version of a traffic cop" to handle the overload. 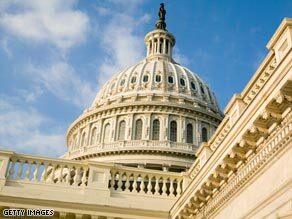 Servers hosting Web sites of the House of Representatives have been flooded with millions of e-mails in recent days. "This is unprecedented," said Jeff Ventura, communications director for the House's chief administrator. The tidal waves of e-mails and page views began after negotiators announced Sunday that a deal had been reached on legislation to enact a $700 billion bailout of the country's financial system. In making the announcement, legislators said the public could view the agreement at financialservices.house.gov. "In a short period of time, lots of Web users were rushing to the digital doorway to get a copy of this thing," Ventura told CNN in a phone interview. As millions of people tried to look at the details of the bailout plan, the House.gov system became overwhelmed and many people saw notices on their computer screens saying "this page does not appear." iReport.com: Do you support a bailout? Ventura compared the situation to the "old days, when you listened to a radio show and the 10th caller got a toaster. Then everyone calls the same 1-800 number at the same time and all you got was a busy signal." "This was a massive digital busy signal," he said. As more people gained access to the page and details of the bailout proposal were published in the news media, constituents then started to e-mail their representatives, Ventura explained. "We know it's in the millions," he said of the number of e-mails that lawmakers in the House have been receiving. "But we haven't counted yet, because when you're about to get hit by a tidal wave, you don't count the drops of water in the wave." After the House failed to pass the proposed deal Monday by a vote of 228-205, the e-mail volume surged again, Ventura said. "Because there were so many e-mails, it was impacting even the presentation of House.gov," he explained. "This morning, our engineers sounded the alarms ... and we have installed a digital version of a traffic cop. We enacted stopgaps that we planned for last night. We had hoped we didn't have to." The office of the chief administrative officer of the House of Representatives issued a statement Tuesday saying: "This measure has become temporarily necessary to ensure that congressional Web sites are not completely disabled by the millions of e-mails flowing into the system. Engineers are working diligently to accommodate this enormous traffic flow and we appreciate your patience in this matter." Now, when House.gov or individual members' sites begin to get overloaded, a message will come up on the computer screen saying, in effect, "try back later," Ventura said. "This really tells us that the level of constituent engagement on this issue is extremely high," he added. He said after the failed vote Monday and the initial backlash, the House's Web site administrators thought there would be a drop in Web traffic -- especially with the Rosh Hashanah holiday. "We monitored the situation all night long, and technicians and engineers saw that we were facing the same demand as yesterday," Ventura said. He predicted that traffic on those Web sites "would start to subside once there's some guidance on the marketplace and political landscape about what comes next." Ventura said the House.gov Web site experienced a very high number of hits when the 9/11 commission released its final report on the September 11, 2001, terror attacks against the United States, but nothing like what the site has seen in the past few days.